Meet your new go-to holiday party appetizer, said Dorie Greenspan in Saveur. 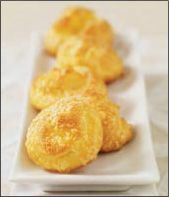 I make these gougères with a blend of French cheeses, but plain cheddar is nice, too. Either way, they’ll be “custardy in the center,” with “a little nuttiness and crunch” from the walnuts. For a firmer puff, use four eggs instead of five. • Place a heavy skillet over medium heat. Add walnuts; cook, stirring, until toasted, 2 to 4 minutes. Remove, then finely chop. Position racks in top and bottom thirds of oven; preheat to 425. Line two baking sheets with parchment paper. In a saucepan, bring water, milk, butter, and salt to a rapid boil. Add flour, lower heat, and stir rapidly until a dough forms. Keep stirring to dry dough slightly, 1 to 2 minutes. • Transfer dough to bowl of a stand mixer fitted with paddle attachment. Let sit a minute, then add eggs one by one; beat each until incorporated. Beat in mustard, then cheeses and walnuts.